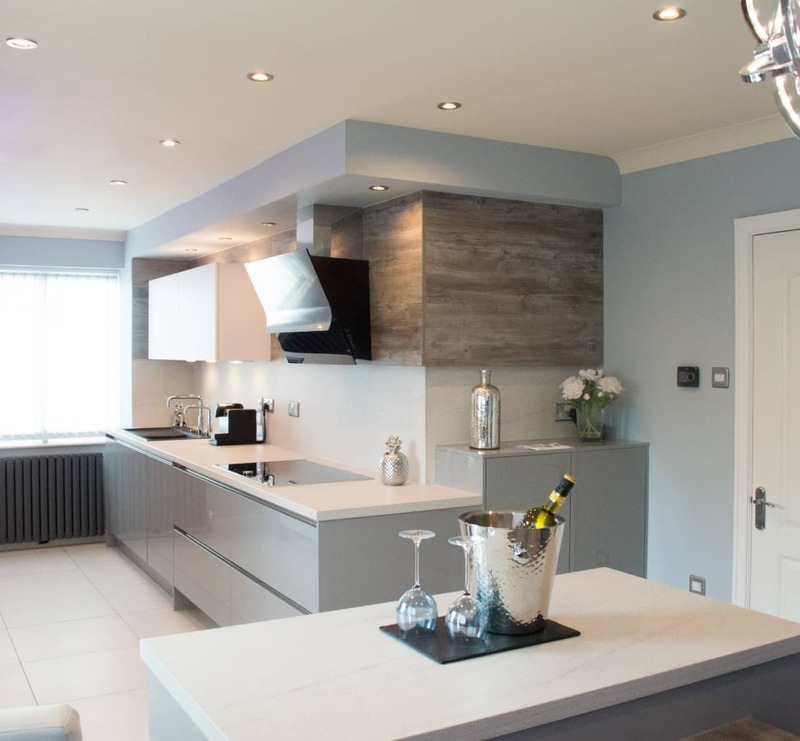 A brand new designer kitchen was all the Edmondsons needed to add that final touch to their new home. 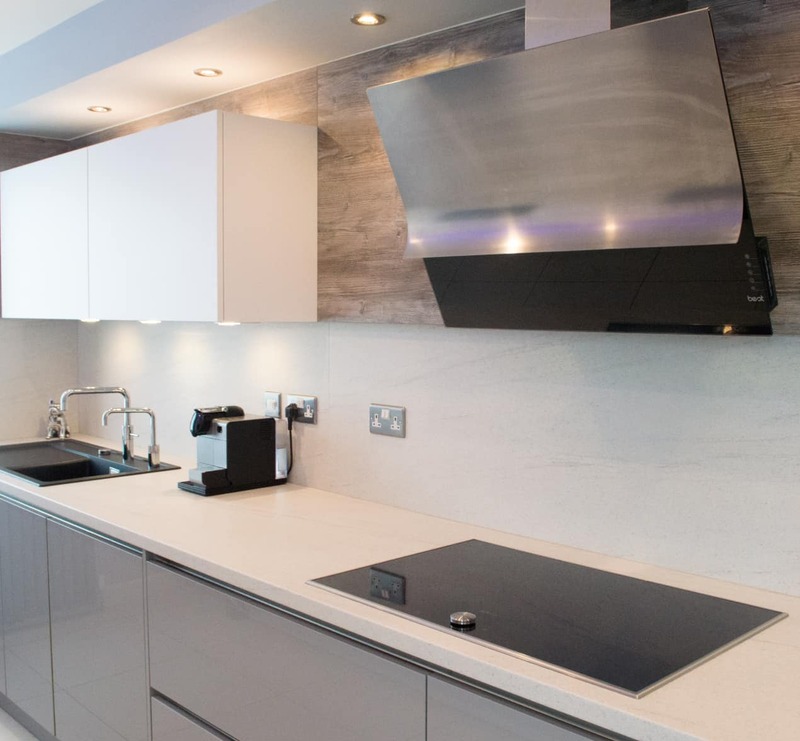 While there was a lot to love about their new property, their kitchen space was rather small and didn’t function in the way the family required. Instead, the Edmondsons wanted a bigger space that would allow ample room for cooking, dining, and family life. 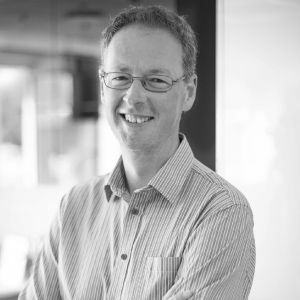 Keen to get the help of the experts, the family set upon their search to find the best. 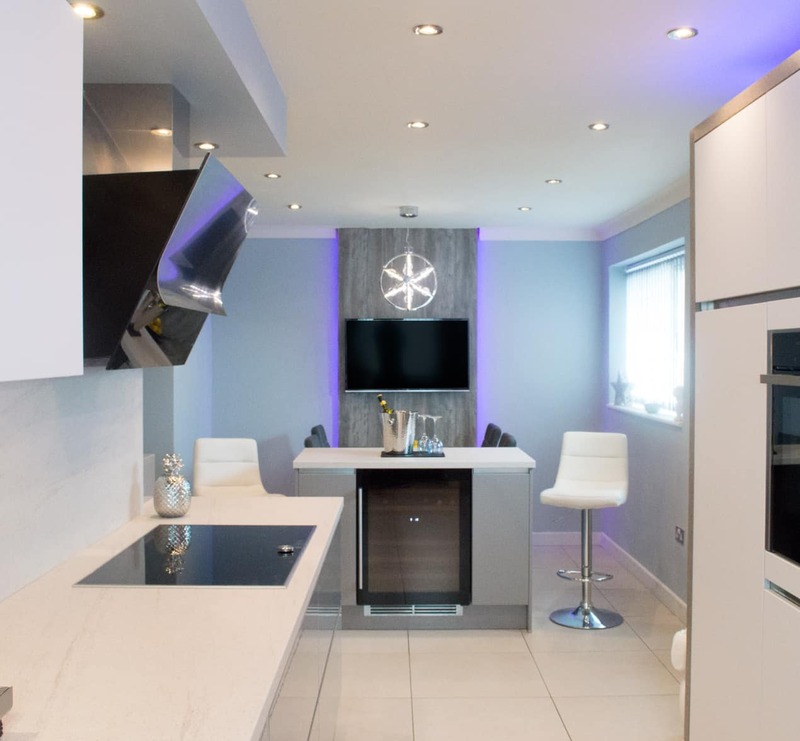 “We went to several showrooms but really liked what Kitchen Design Centre had on offer,” says Mr Edmondson. In fact, the couple discovered their dream kitchen on their first visit! “We saw a great display in the Blackburn showroom – all it needed was a few tweaks,” Mr Edmondson adds. To give them the kitchen space they needed, the couple decided to knock two rooms into one – combining half the living room space with the kitchen. 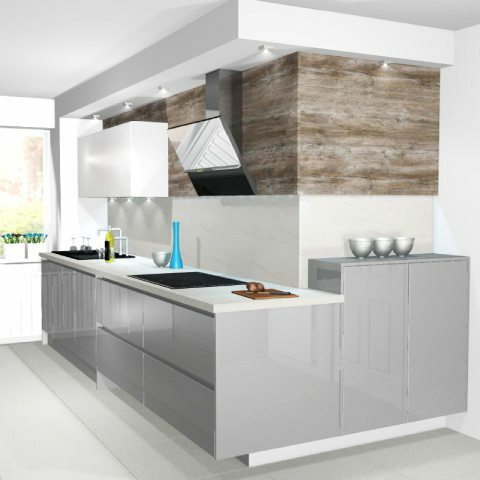 The pair already had a good idea of what they wanted from their new kitchen / diner, so just required a little advice from our expert designer Will. 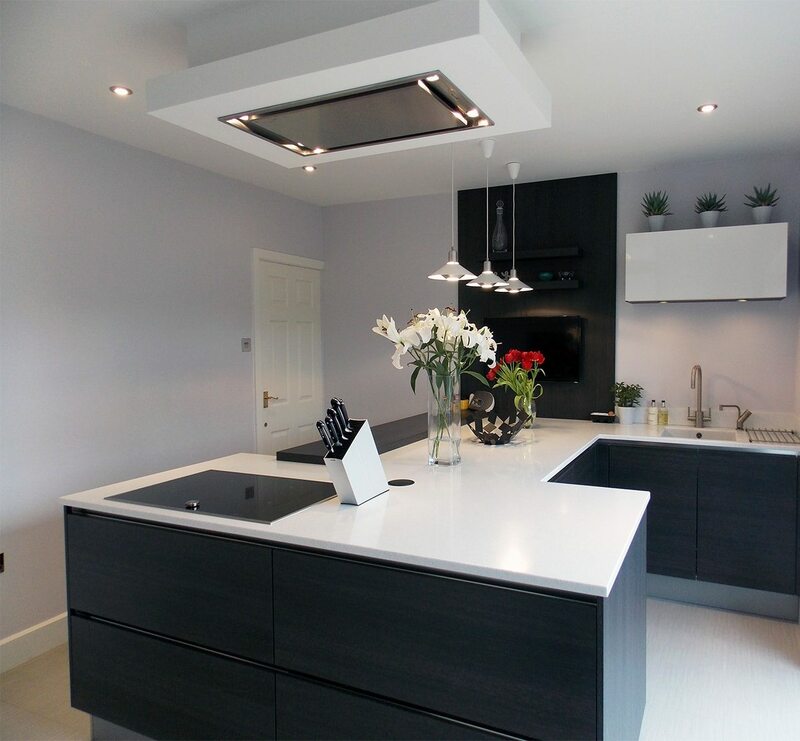 The showroom kitchen chosen by Mr and Mrs Edmondson featured the popular modern German handleless design. In keeping with the sleek, contemporary feel of the kitchen, the Edmondsons opted for a fresh, bright colour palette that wouldn’t date. 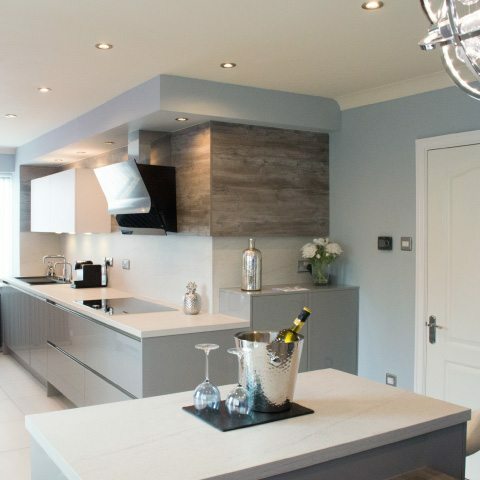 “The new kitchen combines matte polar white worktops with shiny grey cupboards,” explains Mr Edmondson. Mountain spruce wood features were also added into the design for that all-important texture. 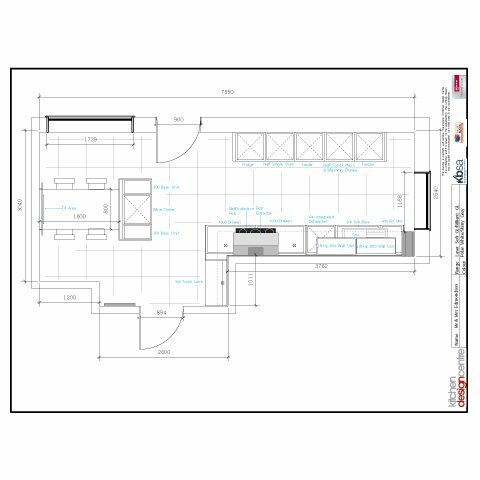 To accompany the stylish design of the kitchen, which featured ample food prep areas and storage space, a number of innovative features were also added. LED mood lighting was placed behind the panels, lighting up the workspace, and an integral dining area was also added – which included a TV mounted on a panel, ideal for the kids. 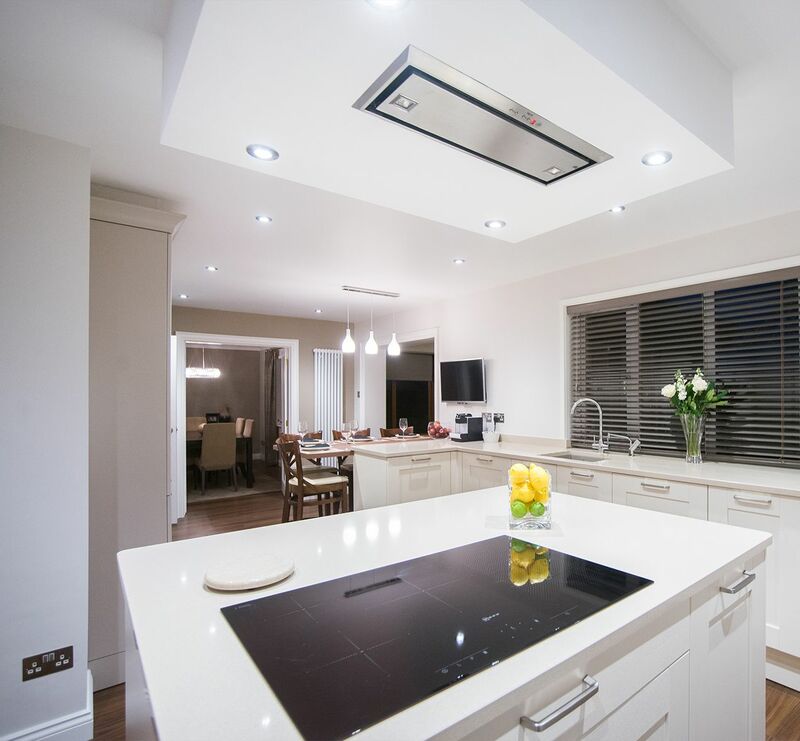 State-of-the-art Neff appliances were another essential addition and ensured that the functionality of the kitchen matched the impressive design. 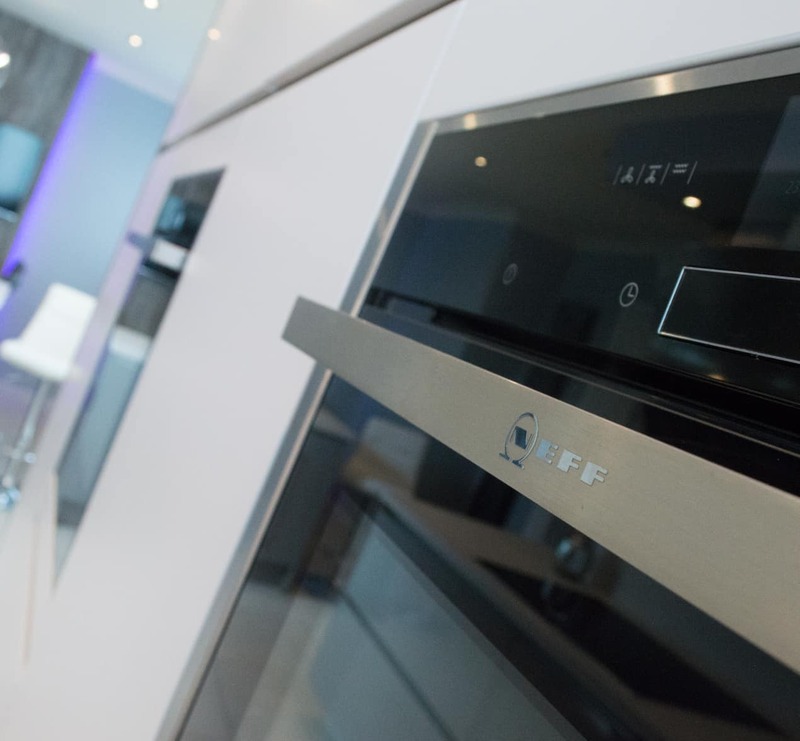 “The Neff cook demos, held on-site at the showrooms, have helped us to make the most of our new appliances,” adds Mr Edmondson. 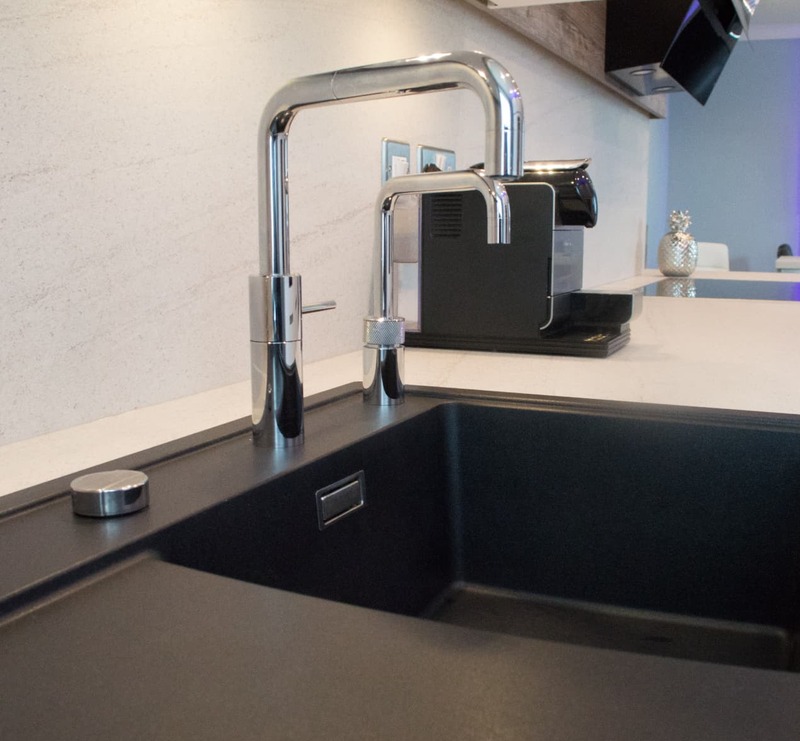 Other features included a Blanco sink, a brand known for its quality and innovative design; the popular Quooker tap; and a wine cooler – a must for all those gatherings and special events! "The showroom designs instantly caught our eye. 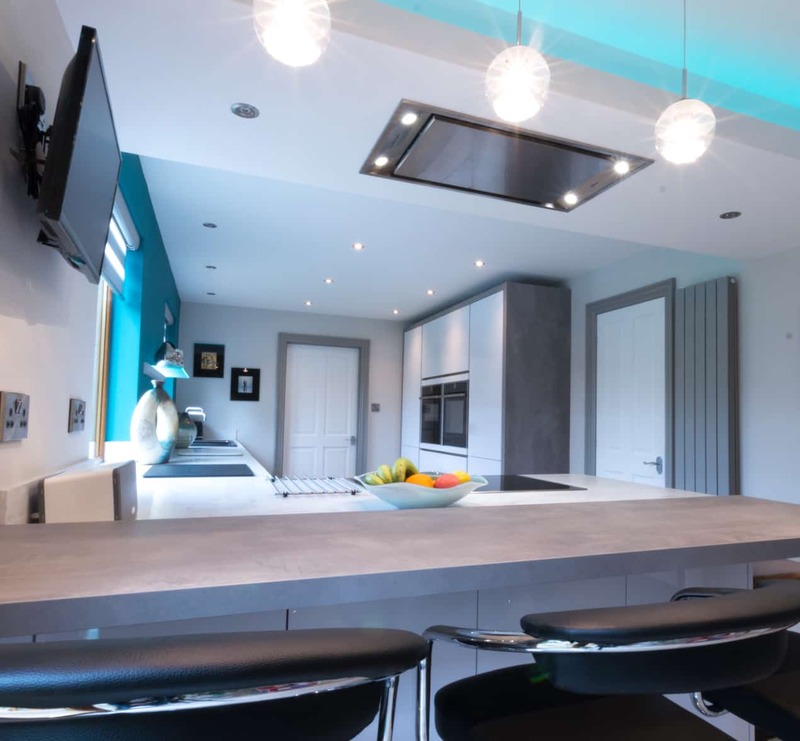 We were able to adapt them to suit our own needs and create the perfect family kitchen"
“It was a pleasure to work with the Edmondsons and create a design that was a little different to the norm."